Will alternative voices get pushed off Google’s first page of results? In some ways, blogs are better placed than ordinary websites, as Google may be indexing your blog as part of its news search. But that isn’t particularly comforting. The wider move towards mainstream results that keep you within Google doesn’t look particularly healthy. If your site is fairly close to what it takes to be considered in some of Google’s verticals – like Google news, then consider upping your game a bit and submitting an inclusion request. Try to make some video content. Not good for everyone, but most sites could use some, and the competitive bar with video is much lower than it is with text – though I wouldn’t expect it to stay that way for more than a couple years. If you have some top rankings that are bouncing around consider focusing on promoting that content again – when stratification occurs you are going to be better off focusing on owning a few ideas rather than being average to slightly above average at many. Top ranked sites also benefit from self-reinforcing rankings. Read up on cumulative advantage if you have not yet done so. Usage data (and/or brand searches) may become a big part of future algorithms. Get ready for that by reading about BrowseRank then invest in advertising, branding, and user experience. The only upside? Google may be making itself less relevant, and more open to competition. This entry was posted in online journalism, SEO and tagged browserank, cumulative advantage, google, PageRank, search, seobook.com on November 5, 2008 by Paul Bradshaw. One of the things that was so interesting about Google's recent re-run of their 2001 search index was to see a Google results page without adverts on it again – but more disconcertingly to perform searches where Wikipedia and YoTube didn't constantly crop up in the results. This really depends a lot on what search terms you use, Paul. Words that are generic and/or commercial will have a bigger chance of having lots of sponsored links at the top of the serarch results and more universals. So terms like <credit card>, <pizza>, <insurance> and so on will have fewer "real" hits. But it's mostly limited to those kinds of terms. A search for<a href"<a href="http://www.google.com/search?num=100&hl=en&am…” target=”_blank”><a href="http://www.google.com/search?num=100&amp…<obama>” target=”_blank”>http://www.google.com/search?num=100&hl=en&am…<obama>gives 206 million hits, but hardly any universals and depending on the country your isp is located in, few sponsored links. So will it limit alternative voices place in the limelight in those cases where the search words are commercial/generic? I don't think so. Because people do not regurarly search the way Google and SEO companies intend them to. Having taught hundreds of courses in online searching, I have noticed that people tend to use what I'd call natural language, as much as isolated search words. 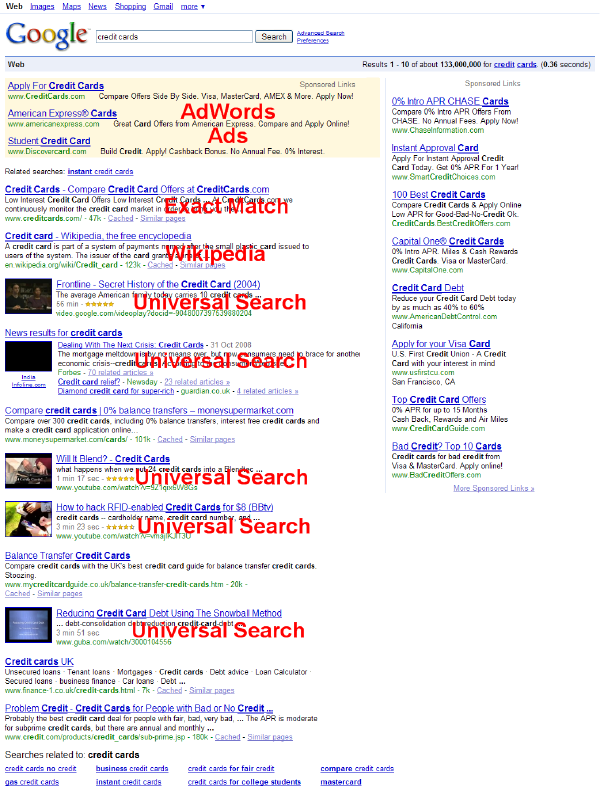 Looking for information when getting a new credit card people probably would search for <best credit card deals> or <credit card consumer report> or words to that effect. People looking for alternative views og commenary will most likely use language indicating that, and thus "beat the system. " Great point, Tord, thanks, although Martin's point above is the counter to that. I think the 'Google effect' is leading to dominant sites becoming more dominant, and Google's own sites becoming more dominant than those. Of course this has an effect. For every new service the google people think up or buy the more they want to show it off and get traffic to it. But showing off the service is s not always enough. Google Video was no success so they bought Youtube. They are not close to Facebook and Myspace with Orkut. Also I think they remember the lesson of Altavista. One of the reasons Google erradicated Altavista so quickly was that Altavista cluttered the search results with all sorts of sponsored links and services. The other main reason of course was Googles superior ranking of results. I think one of the main issues Google will always have to struggle with is that PageRank is an algorithm specifically designed to make the most reputable voices (i.e. websites) win. This becomes an interesting paradox as you would like to have trust, but yet show some diversity of the search terms. Reputation takes time to build why PageRank is not a very good algorithm for presenting diversity, but maybe even the format of presenting diverse voices i a search engine result page in itself is not the best. I do not think Google should do that though, but I agree that the trend to show more and more Google only sources on the first search result page is not a very appealing one from a diversity aspect. It is a complex topic indeed, but further brings up the issues we have seen presented in the movie EPIC 2014. i guess we have to start asking ourselves what type of media outlet we would like to see in the future and who that actors on this new media arena will be. My bet is not that Google search is the right shape. Is Google the wrong? Hard to tell. It depends on what you think, believe or want Google to do. They after all are an advertising company and would like to drive their business towards such. This is completely in line with this. Pingback: http://inthefieldonline.net/blog » Google Search Results - A Place for Alternative Voices?